Cutting wheels on the milling machine or working-on facets on workpieces require a solidly based dividing head with a tailstock. 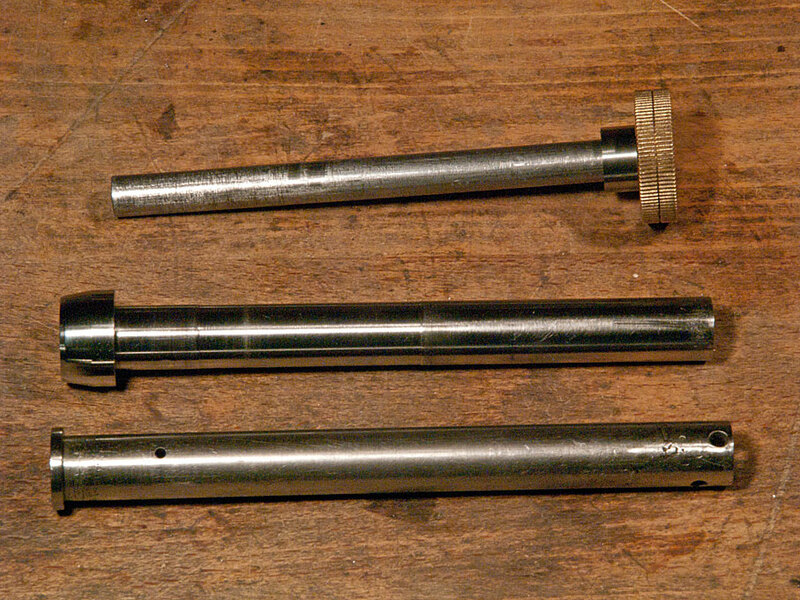 I happened to be able acquire cheaply some WW-lathe parts salvaged from the scrap bin. I gather the parts spend their earlier life in a clock factory, considering the modifications made to them. The central part is a short lathe bed. 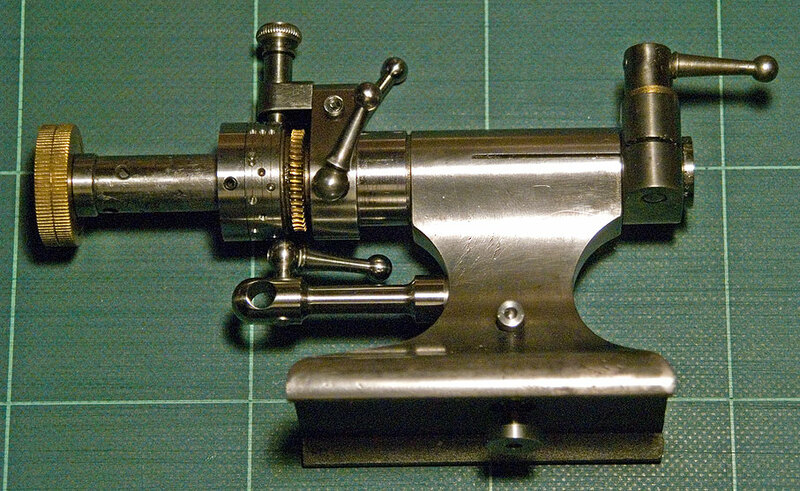 The other important part was a collet-holding tailstock that at some time had a bracket for a depth-stop(?) fitted to it. 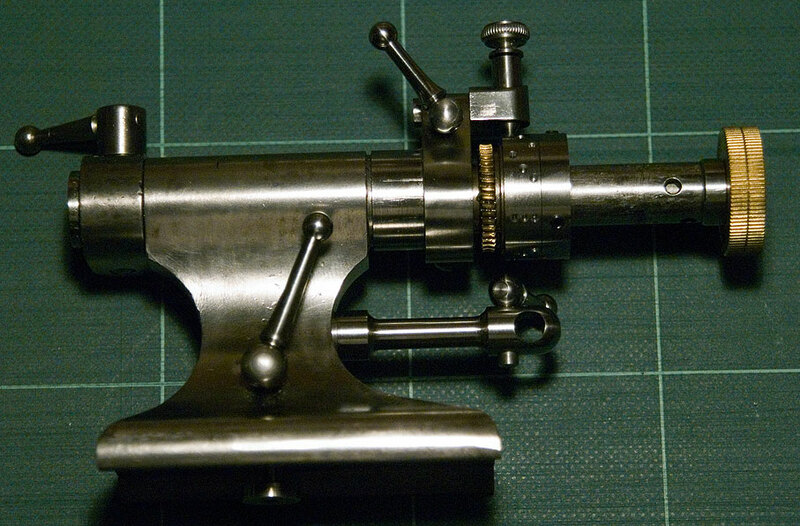 Then I had a simple tailstock for solid runners, or runners for various centres. The dividing head was meant to be arranged for three different types of dividing operations: direct dividing with a small number of simple divisions (2,3,4,5,6,8,10) on a drum, more exotic divisions using a large CNC-drilled dividing disc that I had bought some time ago, and finally I wanted to use on it the geared drive from the other dividing head I had made. 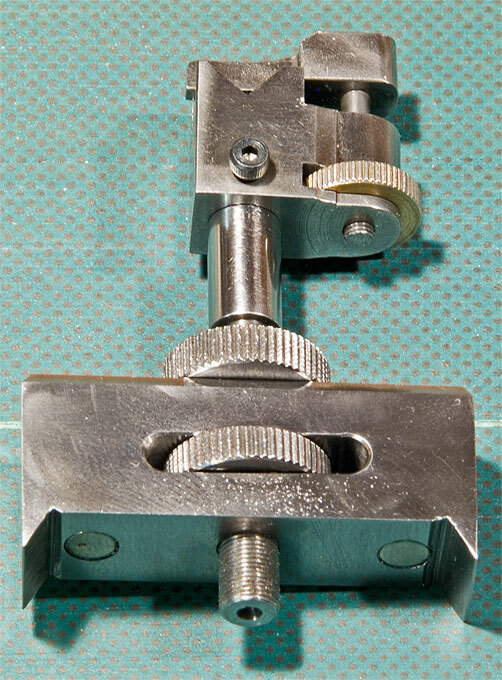 The depth-stop was easily modified to take the sprung stop for the simple dividing drum. 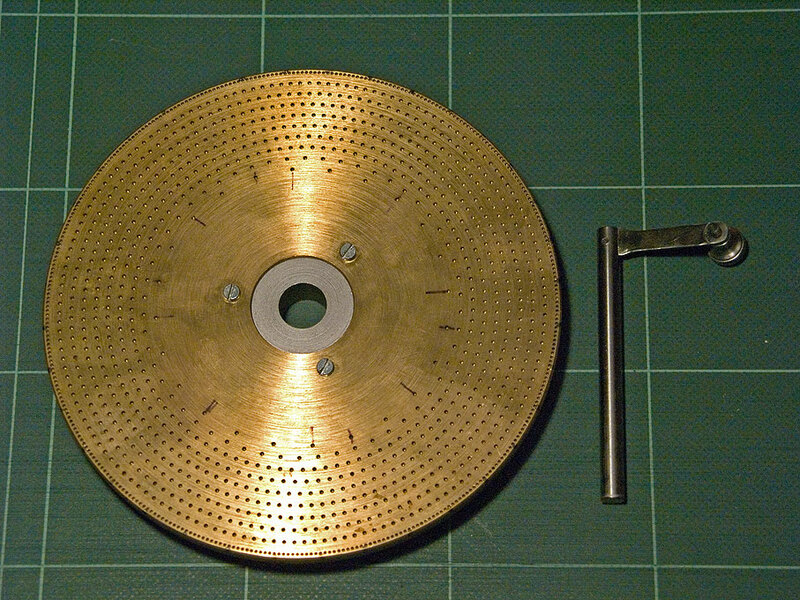 A dividing drum was made, drilling the wholes in situ on the milling machine using the large dividing disc. A commercial worm-wheel was bored out for the collet-holding tailstock runner and keyed to the dividing drum. The dividing drum in turn is clamped to the runner by a compression ring with three screws, as is done for similar parts on lathe spindles. The large dividing disc is fitted to the runner in the same way. 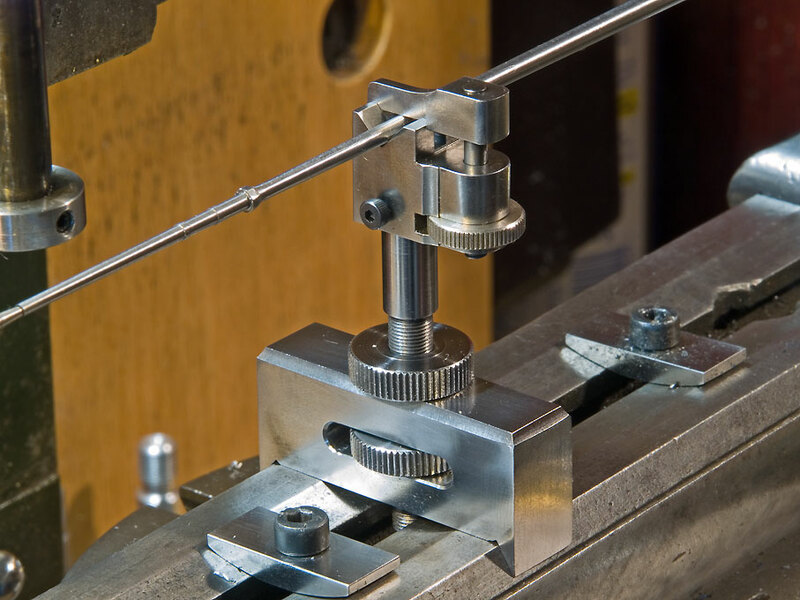 The sprung stop for the large dividing disc is inspired by original products from Lorch or Boley and utilises the tapped hole in the tailstock for the hand-lever. The collet-holding tailstock runner was rather worn. It was tidied up a bit, but its nose is not suitable for taking up ring-chucks, being to thin in diameter and there not being enough 'meat' to turn on the spindle-nose cone. The drawbar was missing the knob, which was replaced by a brass one. 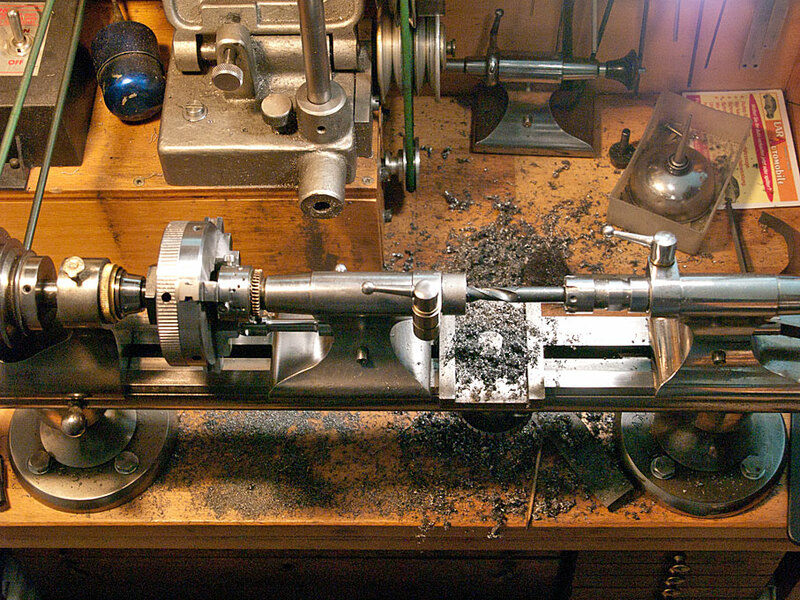 Update 30/05/12: It turned out that the original collet-holding quill had too much side-play in the bore to allow the delicate multi-faceted milling and similar operations the apparatus was intended for. Also, the spindle was missing a cone-shaped nose for mounting ring-chucks. Therefore, a new spindle was made. A piece of 15 mm steel carefully turned down to the 12 mm of the quill. The middle section was relieved so that it bears only at the ends. 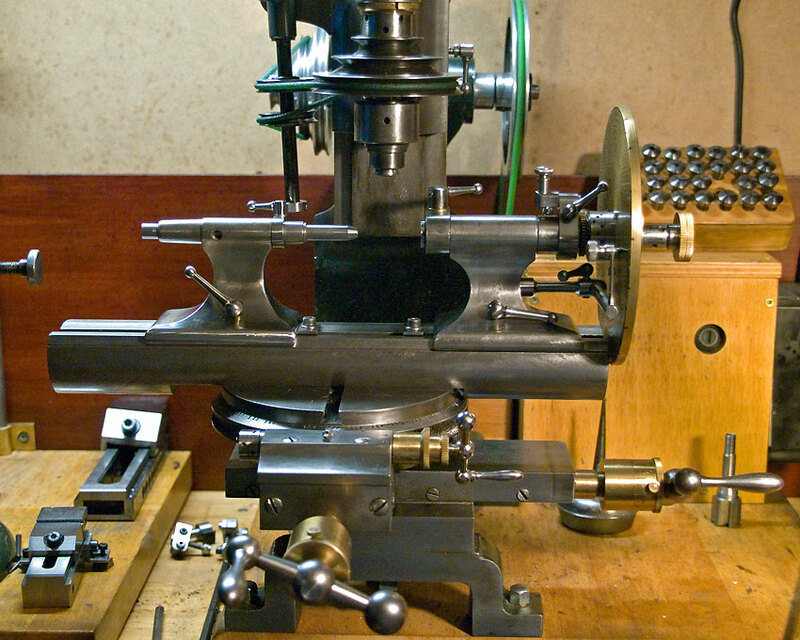 Concentricity of the 8 mm bore and the cone-seat for the collets was ensured by drilling, boring and reaming the spindle in situ, using the tailstock itself as a sort of fixed steady. 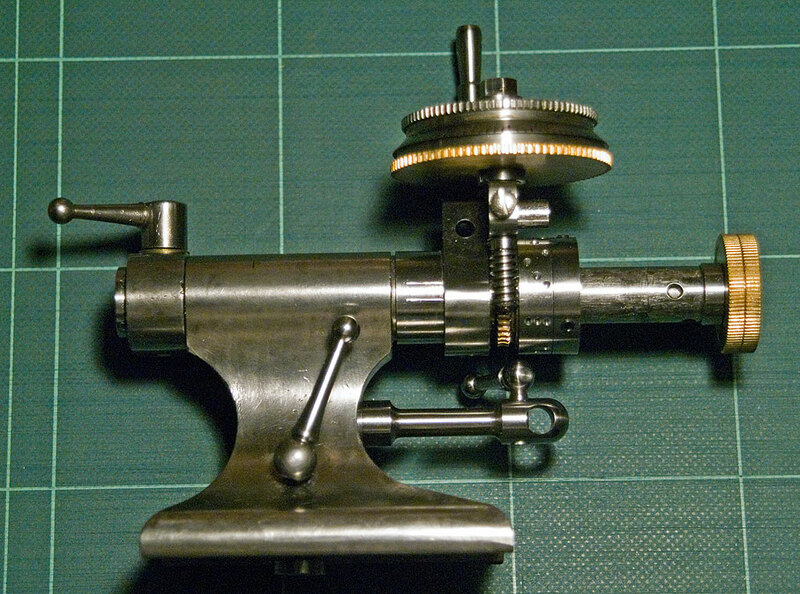 The spindle was driven by using a 3-jaw-chuck as a catch-plate. The whole operation is rather a huge job for the WW lathe and it will be the first and last time, I am going to do such work on it. 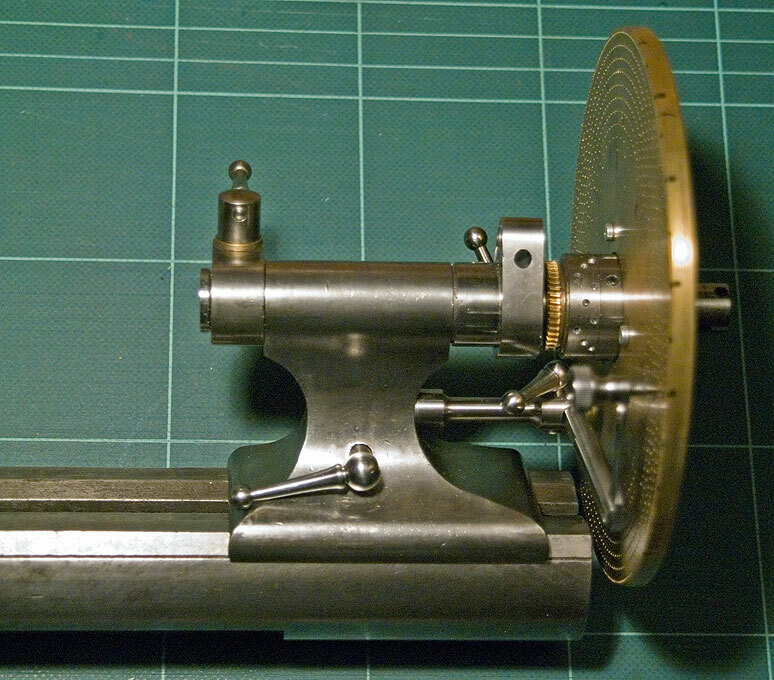 Nevertheless, the operation was successful, resulting in a new spindle that runs like butter in the tailstock and can be adjust to have no appreciable end-play (shown in the last picture, between the drawbar and the original quill). In the meantime I was also able to obtain and original Lorch, Schmidt & Co. steel dividing plate with a rather bigger selection of stops than the brass one shown in the pictures. 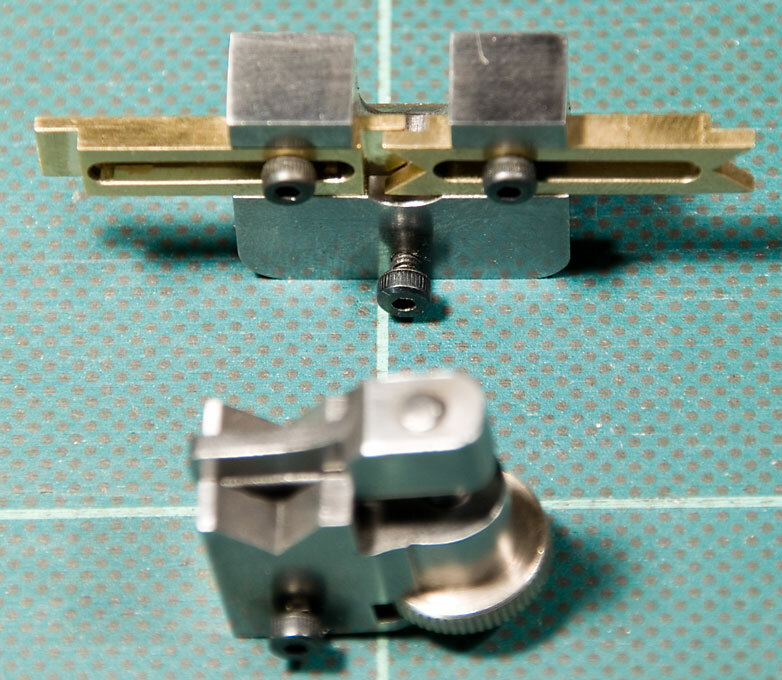 Having made a ball-turning attachment, I decided to fix all parts to the dividing head by lever-actuated cams. 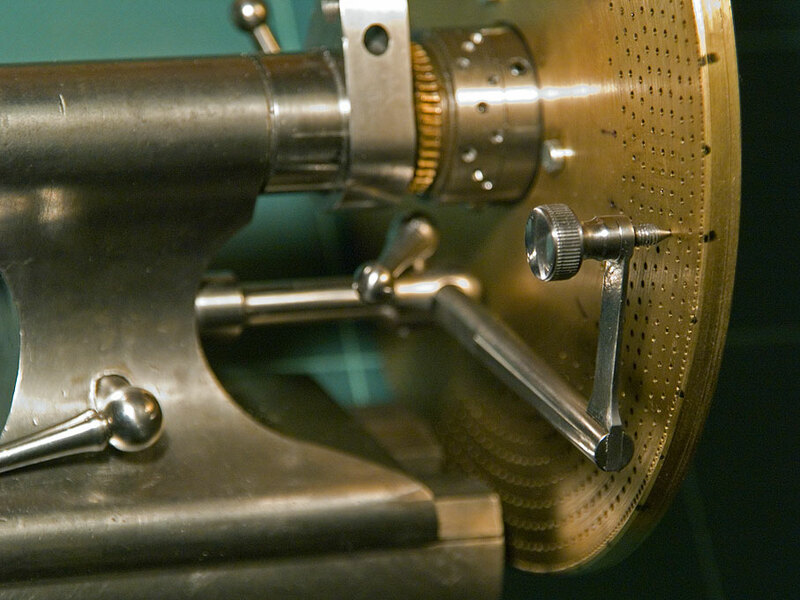 The levers reproduce those commonly found on watchmakers' lathes. 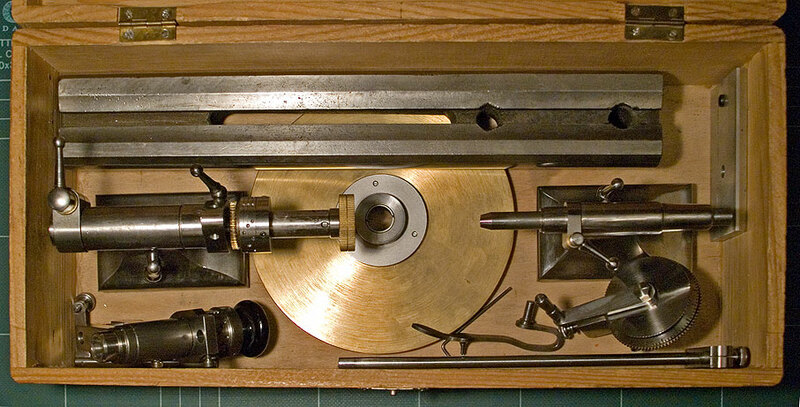 This arrangement looks much neater than set-screws and also follows the style of the WW-lathes. The bed of the WW-lathes for good reasons is rather thick and so I was loosing a lot of clearance under the milling head. In order to regain some of it, I milled down part of the bed by about 12 mm. I would have liked to have even more - and it would have been quite possible without loosing rigidity for this application, but after milling down layer after layer every evening over one week I lost patience with my small milling machine. The tailstock is basically original, but I had to replace the missing compression ring that locks the runner in place. Someone had drilled and tapped a hole for a locking screw at some time. 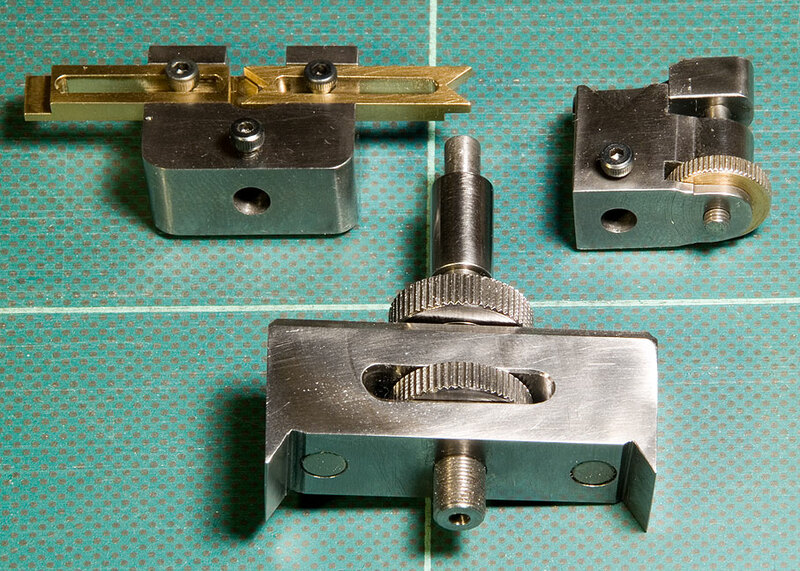 Runners with 8 mm diametre, as needed for the WW-lathes, are surprisingly difficult to find. In the end I manufactured one myself for taking the various male and female centres from the lathe. The most difficult difficult operation was to drill a concentric hole of 100 mm length for the ejector. I still have to make a knob from black bakelite. One of the applications of the dividing attachment is for work on long, slender pieces, such as masts or spars of ship models. These often have octogonal sections to be milled on, or need cross-drilling a prescribed angles. 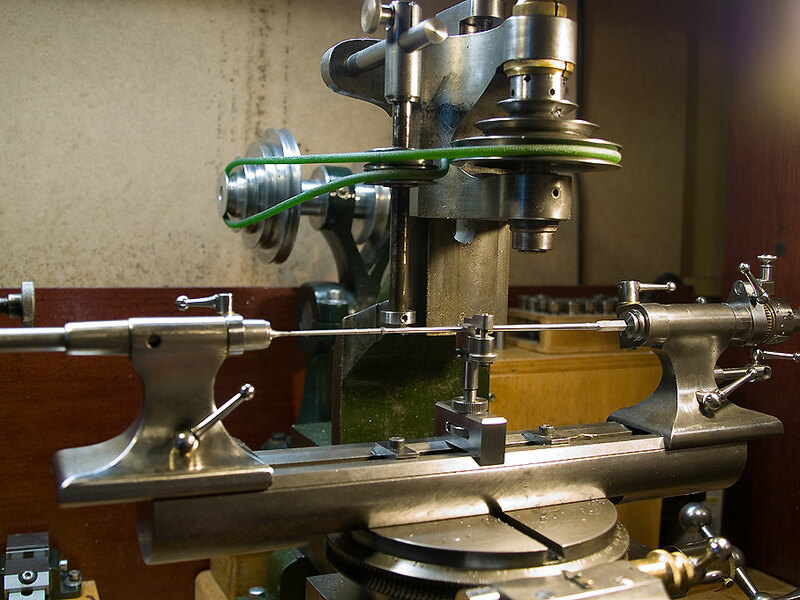 The springiness of the workpieces requires a support near the place where the tool is applied. I constructed a rather luxurious version of a steady that prevents the workpiece from being bent downward and from moving sideways under the tool pressure. 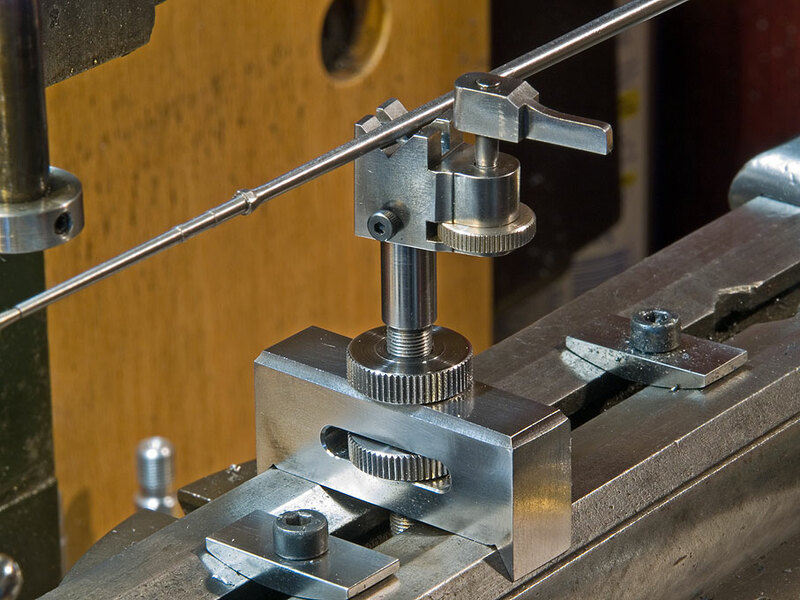 Essentially it is miniature V-block that can raised and lowered to accomodate the diameter of the workpiece and a little clamp that can be screwed down. The device is held to the bed of the dividing attachment by a pair of neodynium magnets. 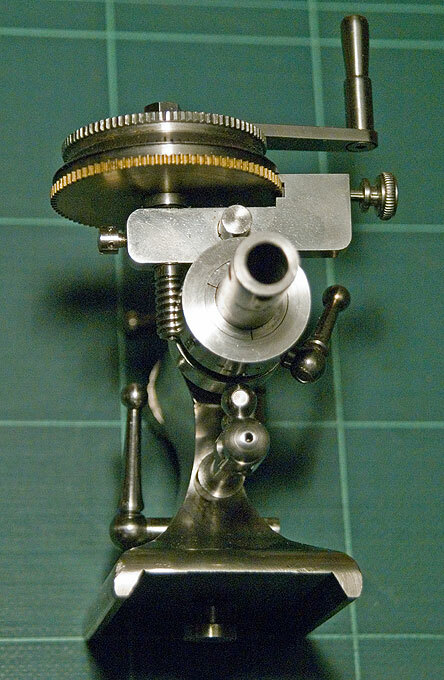 The base unit doubles as a base for a miniature steady rest for turning.